Hey! Valeri here, on this partly cloudy and mostly raining day in London. Our morning began with a wonderful breakfast spread here at the hotel. They had everything: Kiwi, Salami, Prosciutto, cereal, tofu, toast/jam, all sorts of cheeses and more. It was very good. Matthew was also happy that they gave him four juice choices. Well, we began our adventures of the day with getting lost. We are both directionally challenged, which doesn't work well when your main source of transportation goes by northbound, southbound, eastbound and westbound. After going the wrong direction on one of the Tube lines, we finally gave ourselves a good talking to and regrouped ... then we concurred the Tube. We are now experts - Londoners, if you will. 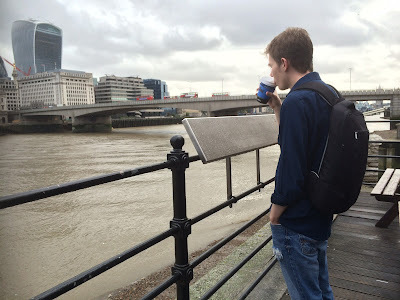 Although we had planned to arrive at Caffe Nero for coffee at about 8:30 a.m., we ended up arriving around 9:30 a.m. and believe you me, we were definitely in need of coffee. They didn't have drip coffee as an option, so we each went with an Americano. I had no complaints, but Matthew is more seasoned in that area, having grown up in a coffee shop, and he gave it a ... well, actually, just read the review by clicking here. After our late morning coffee, we spent some time by the Thames River while waiting for The Golden Hinde II. By this point, it was drizzling a little, but nothing major. Any view from the riverside is wonderful and pictures just don't do it justice. 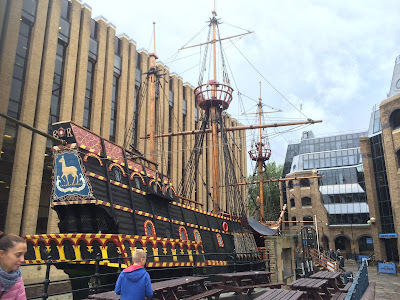 After downing our coffee, we went on a self-guided tour of The Golden Hinde II. It was cool and was very interesting. I'm a big fan of historic sites, so it was great to be able to walk on board the ship and roam the different rooms. The ship has the top deck, then two levels below, which one of the levels below you practically have to be on your knees to be able to walk around. A panoramic from below deck. By the time we finished with the ship, we were ready for lunch. 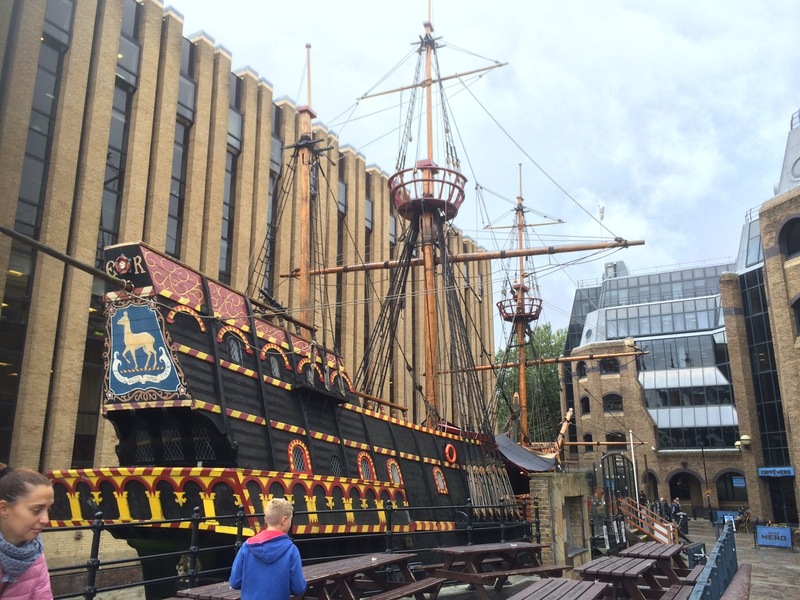 We chose to eat at The Golden Hind, which is actually not near the ship, rather about 25 minutes away. No worries, we made it to our destinations with no incidents. Slowly getting the hang of the Tube at this point. Also, they served our Coke in glass bottles ... which makes The Pearons happy people. 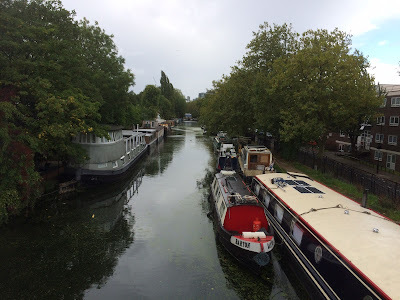 Our next stop was Little Venice. Little Venice was really pretty, however, every photo I took didn't show the full extent of it's beauty. We walked around it all and it looks like most of the boats in the water are actual homes for people and it was pretty interesting to see how they were all decorated differently. After walking around all of Little Venice, we walked around some of the neighborhoods on the outskirts and came across a couple cool buildings. 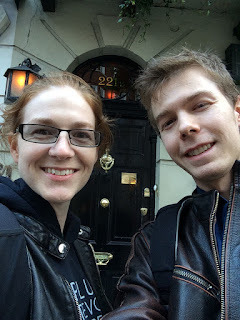 Although we were originally planning on eating dinner at a little shop somewhere in Little Venice, we ended up leaving earlier than planned, so we went ahead and headed to Harrod's, figuring we can get dinner somewhere around there. FOOD! 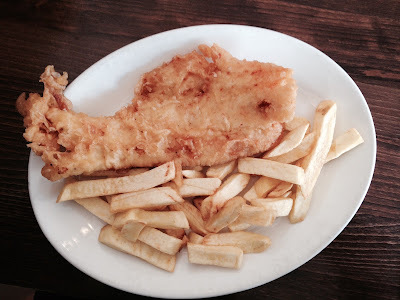 Matthew decided on staple British foods and I had Chinese food. We decided to take our food to Hyde Park and eat while enjoying our meal. It was getting pretty chilly at that point and raining off and on, but the view was well worth sitting on a bench in those weather conditions. Our last few spots for the day were mainly us just wandering London's streets. We made our way to 221B Baker St. For those of you not in the know, this is Sherlock Holmes' residence in the books/TV show. The British Library was our last stop and I'm so glad we decided to go. It. Is. Amazing. I can't even describe it other than this: 8 levels, full service café and The King's Library. 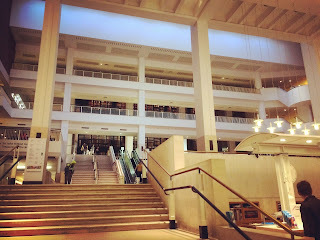 Tomorrow we will be visiting the London Library and I cannot wait! Well, tomorrow is another busy day and right now it is about 1 a.m. here, so I must let you go. Also, I know this post was long, but there's just SO much to share! Sorry, not sorry. 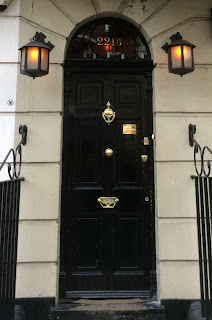 Go to http://CL3VER.life/ for other blog posts and more photos by clicking on "Photos: Surviving London" to the right of the page!